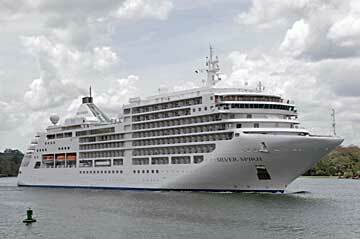 The MS Silver Spirit is a cruise ship ordered by Silversea Cruises in 2008. The ship will be the sixth and largest ship of the Silversea fleet when it enters service in 2009. Silver Spirit will feature 270 ocean-view suites, providing the largest suites of the fleet. Silver Spirit will feature six different restaurants, a spa measuring 8,300 square feet and the Stars Supper Club with live music, dancing and night-club style entertainment. On 23 December 2009, Silver Spirit will depart on her maiden voyage from Barcelona, Spain to Lisbon, Portugal. 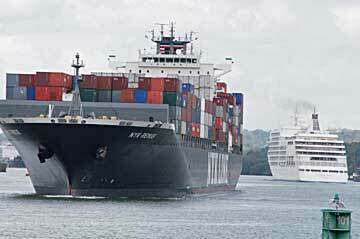 Following this sailing, she will commence her maiden transatlantic voyage from Lisbon to Ft. Lauderdale, Florida. 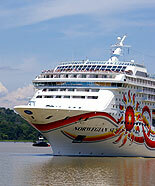 On 21 January 2010, Silver Spirit will embark on her inaugural voyage. This will be a 91 day voyage around America. 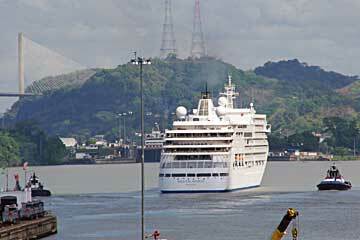 The MS Silver Spirit is shown here in the attached images on her North Bound Panama Canal transit on April 14th 2010.